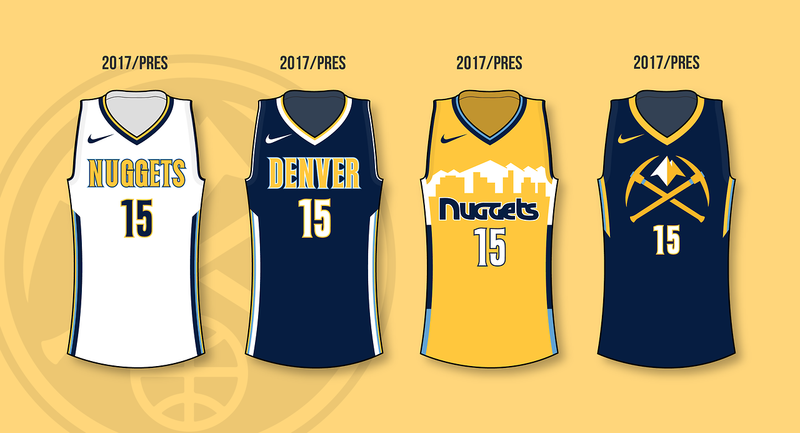 The thing is, this new Nuggets look had POTENTIAL. The issue is that they decided to do :censored:ty colour balance with the jerseys and create a third that looks even more awful. Had they tweaked things so the look was more cohesive, the Nuggets would look fine. But hey, they've torched every jersey they've worn since Ujiri left them with every little tweak starting in 2015. 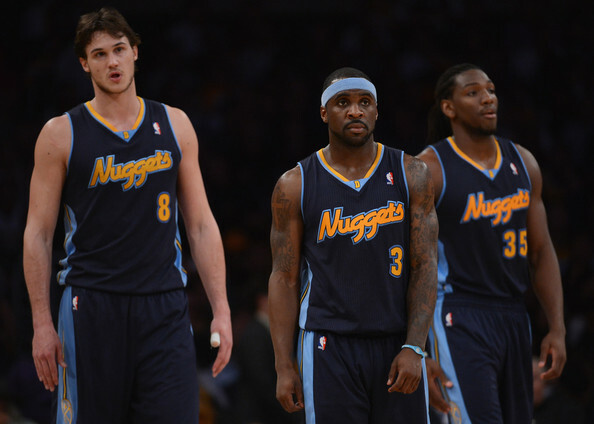 EVERY SINGLE ONE has been nothing short of a bad idea save for that White sleeved jersey they wore cause the shorts + the Nuggets icicle wordmark on the back were cool. 2. ^ The yellow alternate "Nuggets" font was changed to the old skyline font & the number was moved from the right shoulder to the left. The number thing isn't that big of a deal, but the wordmark looks out of place. Look at how much cleaner that looks, how the colour balance was fine as is, how the "Nuggets" wordmark on the yellow alternate looks like it belongs.... every change made for the worse. Don't forget about this classic too. A shame they neutered such a great brand. Well sorta. At least the gold is brighter and the colors are closer to the vibrant Colorado state flag. Yuck! 2003's or Rainbows were good enough. A Home run or Kitt_Smith95. Wow, look at those awesome plain lanes! Welcome to the bigs, you've made it, here's a rec center with a food court around it. Has anyone ever put logos inside the lanes like that? Cleaner? I’m on a phone (small images) and I can’t read NUGGETS on the home jersey in that last image. I can barely decipher the player number because it’s so filled in with needless extra color. Sure, the new set could use some tweaks, but at least it checks the most basic design box: legibility from a reasonable distance. I don't see how the 2014/15 set isn't decipherable. Sure, the kerning could've been better, but it was always pretty legible. Hard pass on that 2014/15 era. I don’t think legibility was good at all. The poorly kerned type, extraneous outlines, surplus of light colors without enough dark to balance... it was a mess! No nostalgia for that era at all. It doesn’t read as “clean”, quite the opposite in fact. The 2015-2017 wordmarks had so much promise compared to the 2014/15 and 2018 ones. 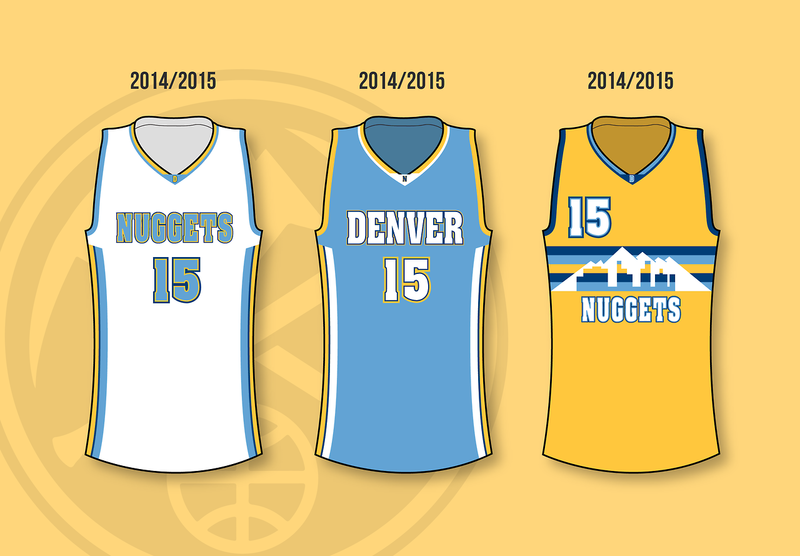 If the Nuggets did a single outline and matched the numbers, it would be awesome. But it's like every year they have a mess on their hands. The current wordmark is the absolute worst. ...The current wordmark is the absolute worst. Yet it’s the only one you can read from the stands on both the white and dark jersey. In other words, it’s the “cleanest” one they’ve had in decades. The uniform selection in NBA 2K19 is incredible. Alot of gems and rarities that I wasn't expecting. I was definitely not expecting that purple road alt the Kings wore from 1999-2001. And wow, all 3 Sun Burst era jerseys are present and accounted for. New Jazz court for the upcoming year. Won't lie ... I don't like the look. It's great to see 2K is still on top of their jersey accuracy. Hopefully a sign of things to come in the future. Really would like to see that teal set on the court again. That's a pretty unnecessary change. Sometimes, I just want to headbutt the individuals that suggest such things. The Jazz and Clippers really do have the most boring branding in major sports. Not only is color scheme horrible, but the center court logo is....just a basketball? I wouldn't say never, because we've seen the Clippers play as the Braves, LA Lakers as the Minneapolis Lakers and Wizards as the Chicago Zephyrs. But, I have a hard time seeing the Memphis Grizzlies do a full out Vancouver throwback. The Vancouver jersey imagery is location specific to the Pacific NW. It has NO connection whatsoever with Memphis. But, with that said, I think we'll a throwback set of the 2001-02 look and more future jerseys including elements of the Vancouver jerseys (like this year's statement jersey). We can hope, but I don't think we'll see a Vancouver throwback. I don't mind the Jazz branding. I guess it's familiar with me. However, they are pretty dang conservative with their look. I think that's why the City Jerseys sold so well. It was completely out of the box for the Jazz to be that bold. And, don't get me started on the Clips. Exactly. It looks incomplete. If it was two-toned or had some stained design into the court it could work. I wonder if they did it make a second secondary doable so they can have purple around the edges when they wear the purple throwback?